Yesterday afternoon, freshmen received tours of MIT's athletic facilities as part of a new addition to Orientation - Sports and Wellness at MIT. The activity began in Kresge Auditorium, with presentations about athletics and health at the Institute. Partially introduced as a replacement for Project Move Off Your Assumptions, the activity was designed as an integrated introduction to athletics and health activities at MIT. Cheerleaders performed in Kresge. Later, they were joined by members of the women's crew and field hockey teams for a ragged rendition of the MIT cheer. After the performance, William M. Kettyle, associate director of MIT Medical, spoke about student health at MIT. His talk focused on "the five S's": sleep, sustenance, sweat, stretch, and shower. Kettyle presented the freshmen with data showing how errors by car drivers, airplane pilots, and in reaction time increase during periods when people are normally asleep. He went on to emphasize the importance of regular meals, exercise, and stretching for MIT students. "Fanny fatigue" can be a problem at the Institute, he said. Kettyle then introduced Stuart Schmill '86, head coach for crew at the Institute. Schmill provided an introduction to the athletic system at MIT. He also announced that the athletic facilities would be open free to freshmen through the first week of the semester. More students participate in various athletic activities at MIT than at almost any other college, Schmill said. 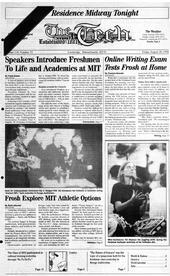 That may be because MIT students have more free time than students at other colleges, he said, "but I was a student here, and I don't think you'll find that that's the case." After Schmill's speech, the freshmen left Kresge and rejoined their orientation groups. Each group combined with four others with consecutive atomic numbers to participate in a cyclic tour of the athletic facilities at MIT. The groups spent ten minutes at each stop on their tour. During that time, they heard talks by and asked questions of coaches, athletic department employees, and student athletes. During the tour, members of many sports teams showed off for the freshmen. As each group of new students walked through Steinbrenner Stadium, they watched the varsity football team in various stages of drills and practice. The crew team set up an eight-man shell in front of Kresge to greet the freshmen as they emerged and answer any questions about their sport. "I think the opportunity for people to actually see the activities, rather than just hearing or reading about them, will be positive," said Roger Crossby, director of sports information and one of the presenters. This may improve sports recruiting, or it may increase attendance at sports events, Crossby said. "If we get one more of each, that's positive." Along the tour, many presenters continued to emphasize the health aspects of athletics. Larry Anderson, a basketball coach, quoted the Book of Proverbs, saying, "If you have a sound mind, you can also have a sound body." Staying active physically is an important part of a healthy lifestyle, Anderson said. Student reaction to the event was generally positive. "I found the tours very informative," said Keith A. Bonawitz '02. "I didn't do any sports in high school, but I'm looking to get involved" in sports at MIT, Bonawitz said. "I think it was a good idea, getting to see everything that was available," said Effy J. Klopfer '02. Organizers also called the event a success. "I think it went great," said Interfraternity Council President Duane H. Dreger '99, the organizer of the event. "It's a lot better than the old MOYA." The response from freshmen has been very good, Dreger said. They were happy to see all their options, he said.